Family Fun and a FREEBIE!!! Hooray!!! Summer is almost here! For most families summer vacation means more time for family fun. Camping offers opportunities for family fun and creating memories that will last a lifetime. This post has camping themed ideas and resources that will work for families or classrooms having End of the Year Classroom Camp Outs. A Camping Spree with Mr. Magee by Chris Van Dusen is one of my favorite books to share with children. The delightful illustrations and rhyming words whimsically tell the story of a camping adventure that will capture your little learners' attention. 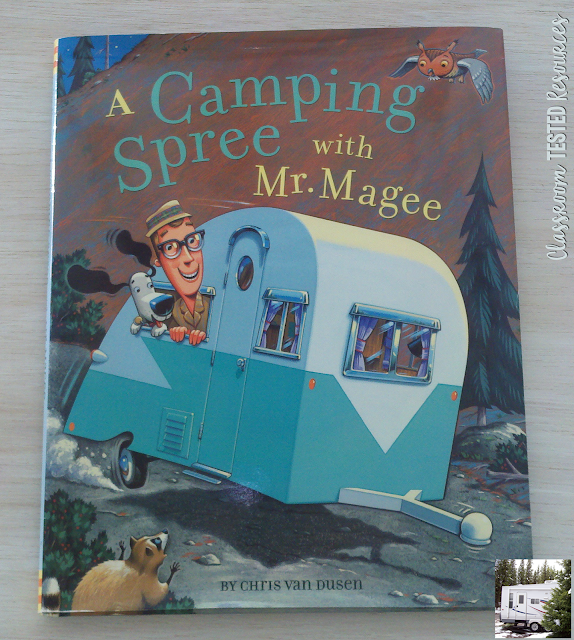 The story begins with Mr. Magee and his dog, Dee, setting off in their vintage Rambler convertible and canned ham camping trailer to camp in the mountains. Though their camping plans are adjusted after the excitement of an encounter with a bear, the two make the best of their situation and still have a great time. Here is an easy and fun way to practice addition facts for your little learners. Eating the graham bears when the addition practice is complete makes the activity even more enjoyable. 1. Give each child a 3-sectioned plate, bear graham crackers, a small dry-erase board, and a marker. 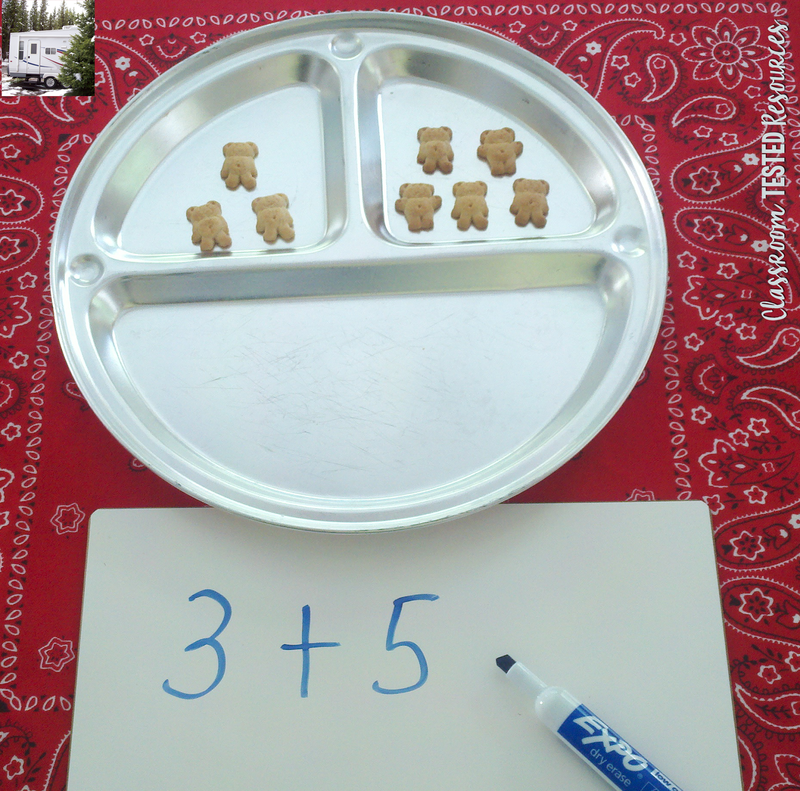 (You can adjust the amount of bears you give each student to address the addition facts for any given lesson or to meet the needs of individual learners.) Learners put bears in the top sections of the plate. They use the dry-erase board to write the addends for the corresponding addition fact. 2. Learners combine the bears in the large section of the plate. They write the equal sign and sum to complete their equation. 3. Repeat the procedure with learners making different equations. 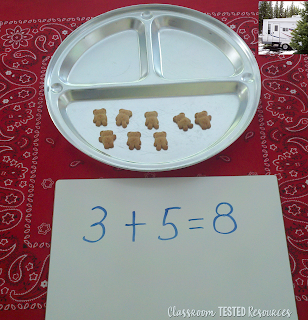 When learners have completed the addition activity they get to eat the bears. Yummy! This simple snack is fun and tasty. It is a great followup up activity to the Mr. Magee book or can be used as a stand alone activity. 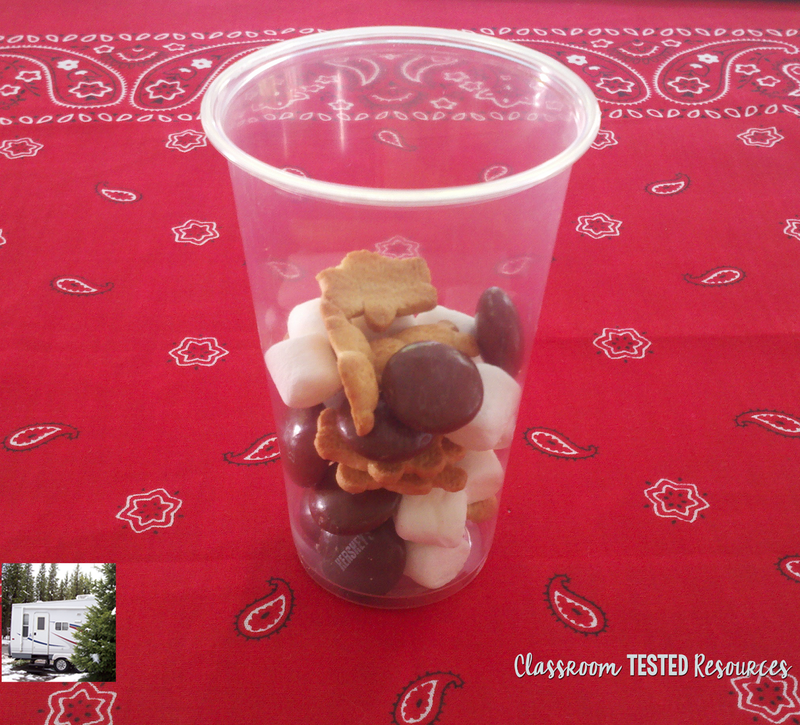 You may mix a big batch or have children count out the items used to make their individual cups of snack mix. 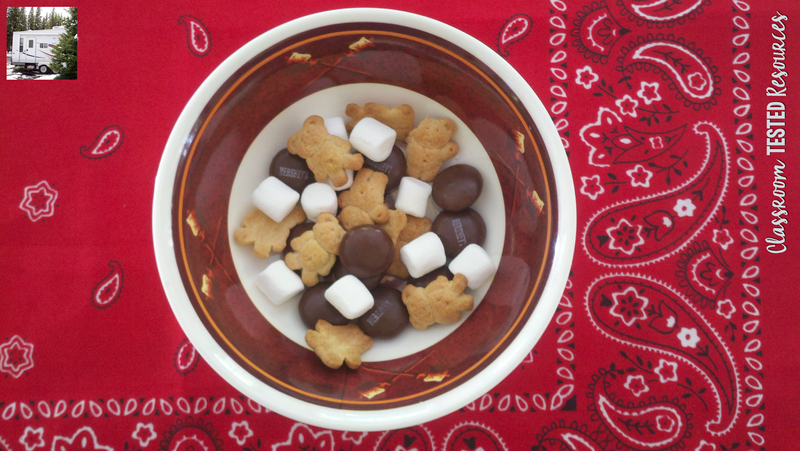 I like to tell children the bears are for the bear in the story, the marshmallows are like the ones the bear loved in the book, and the chocolate is for the rocks in the story. 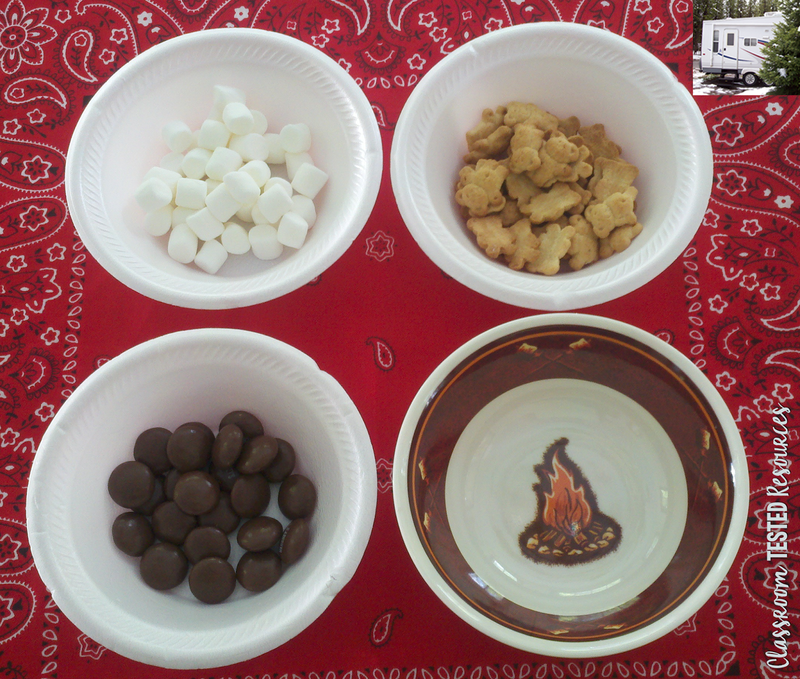 You may substitute chocolate chips, chocolate covered peanuts or raisins, or candy coated chocolate candy pieces for the chocolate I used. If your school is a peanut free zone or your child has food allergies, you can adjust your ingredients to comply. 3. Put the ingredients together in a bowl or plastic cup. If you are hosting a camp party you may not want to use this snack as a counting activity. 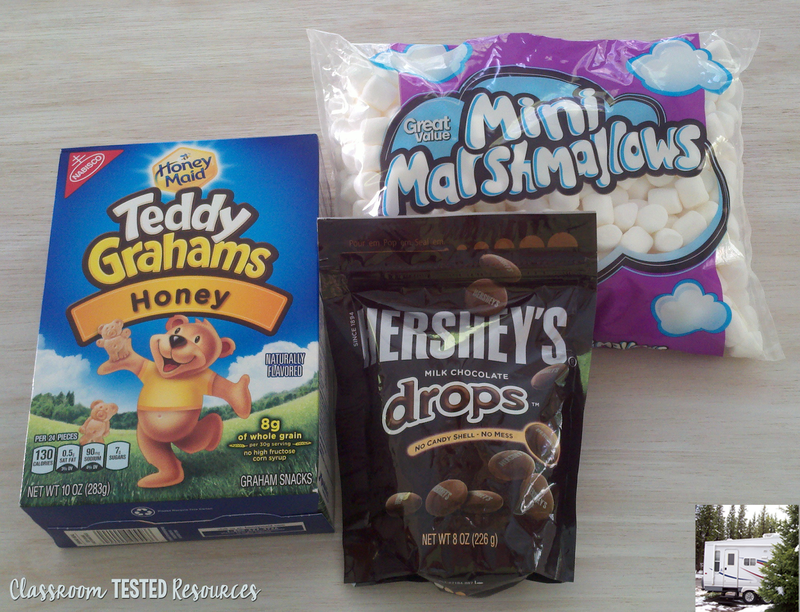 You can just mix these ingredients together in a larger bowl and serve. 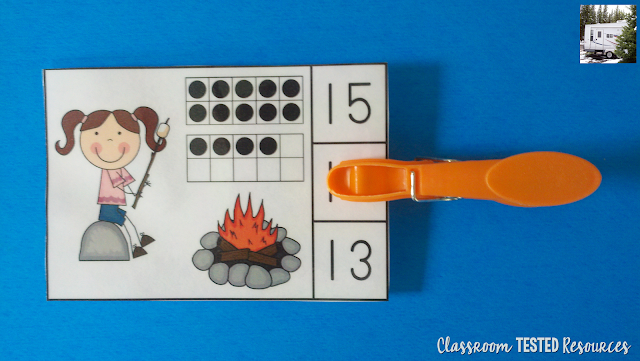 Campfire Kids Rock Count and Clip Cards give your little learners an opportunity to practice counting and cardinality skills and address fine motor development in one easy to use activity. You may use all the cards or select the cards that best meet your learners' needs. Place the cards and clips in a zippered binder pouch or plastic pencil box for easy storage. These cards make a great fast finisher activity or portable activity to take on a family camping trip. 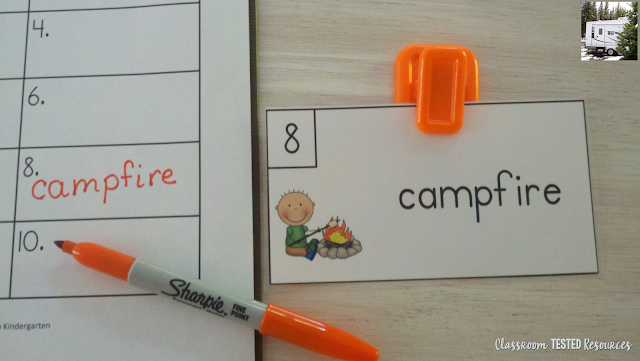 We Love Camping Write the Room gets your little learners up and about the room while learning. My students love the different "Roam the Room" activities. They are always eager for an opportunity to use clipboards because they consider using clipboards to be an adult task. I have even had students buy their own clipboards and bring them to class because they enjoy using them so much. I must admit that I love to watch them using the clipboards, too. They are so cute moving about the room with their clipboards, modeling adults they have seen using clipboards. Watching children enjoy activities I have planned for them is always thrilling to me. I also like learning activities that get the children moving around and actively engaged in their learning. "Roam the Room" activities are a great way to incorporate movement into learning activities. Many studies have determined that providing opportunities for movement in the classroom helps learners stay focused and decreases discipline issues. This makes the school day more enjoyable for students and teachers.